Cyera Hintzen scored twice, including the winner in overtime, to lead the No. 21 Texas soccer team to a 2-1 win against No. 23 Central Florida on Friday in Chapel Hill, N.C.
Coming off a draw with the No. 4 Tar Heels on Wednesday, the Longhorns improved to 2-0-1. “I think it was end-to-end action once again,” coach Angela Kelly said in a postgame interview on the team’s Twitter page. “Central Florida’s a quality opponent. We had to battle. Just really proud of the team. Hintzen recorded her fourth goal of the season and has scored in every game. Her golden goal at 92 minutes, 38 seconds makes it eight career match-winning goals. “I was just ready to cut and finish it in the back post,” Hintzen said of her winner on the team’s Twitter page. Texas got rolling in the first half on Hintzen’s first goal in the 23rd minute. Katie Glenn and Emma Regan set up the score for Hintzen from about 6 yards out. Central Florida got back in the game five minutes later on a goal by Zandy Soree, assisted by Dina Orschmann. Tecora Turner nearly put Texas ahead just four minutes after that as she hit the crossbar. 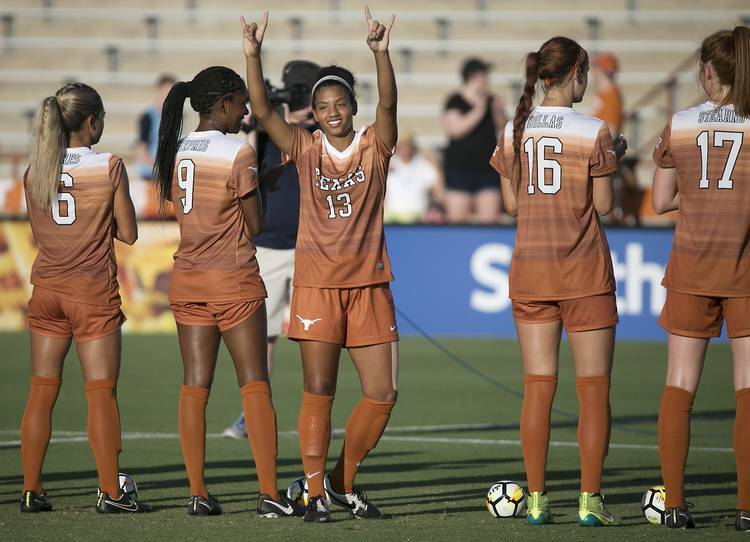 The Texas soccer team will return to Austin for its home opener against Long Beach State at 7 p.m. Thursday.